Robyn Scott, author of Twenty Chickens for a Saddle, will be speaking in the Saltair Room in the Union Building today at noon! Don’t miss out on this opportunity to meet a fascinating woman before she literally boards a plane back to London! Click on The Bookmark at the U link under my blogroll to read the guest blog she wrote for our store. At the bottom of the blog is a link to the podcast we produced to announce her appearance. Today’s the day! I am indebted to Robyn Scott for providing the title of this post as well as the real privilege of never being bored while reading her pioneering book, Twenty Chickens for a Saddle (Penguin, $24.95). The Scott family are pioneers in the medical, scientific, and trailblazing sense of the word; now Robyn has added literary to that list! I’ve never read a book like this before, and I consider myself an avid reader. Like the Christmas trees the Scotts decorated on Molope Farm, it is a unique breed. Molope Farm, Robyn’s childhood home, was a 2,000 acre farm in the bush of Botswana, just across the Limpopo River from South Africa. The Scott family relocated from New Zealand to Botswana when Robyn and her siblings, Damien and Lulu, were just children, but the book’s subtitle “the story of an African childhood” hardly describes the incredible story told therein. Even the most innocuous anecdote about her infamous Grandpa Ivor, a bush pilot known throughout Botswana, would seem outlandish recounted in this blog; in the book, it is a typical childhood memory! 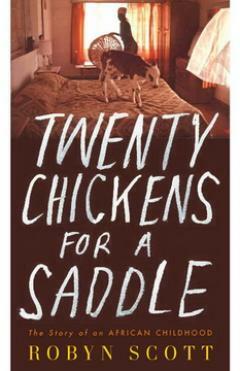 Twenty Chickens for a Saddle is a difficult book to categorize, but a cinch to recommend. Read this book! Read it precisely for the reason that you would normally pass over it on a shelf of books by typical authors on typical subjects. Do not pass over this book! This is a reading experience that will take you far beyond your broadest horizons. Twenty Chickens for a Saddle is an ideal selection for a book club, as you will not be able to resist discussing it afterwards. You’ll probably wind up blogging about it, too! More or less in that order!